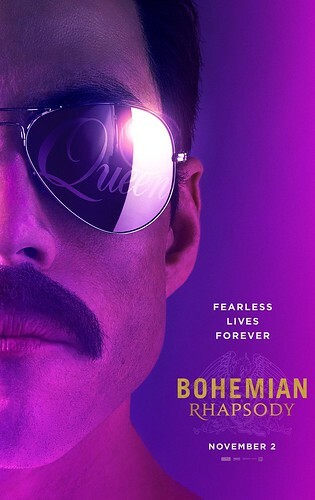 Fox’s Bohemian Rhapsody, about Mercury’s rise to fame as the lead singer of Queen, opened this weekend to an estimated $50 million in domestic ticket sales. Here is the Weekend Boxoffice Chart for the weekend of November 2nd to November 4th. I saw Bohemian Rhapsody.... it was good. But it was so plain. The music carried it, well acted, entertaining.... but didn't seem to have a soul. The movie "Control" about Ian Curtis and Joy Division was way waaay more impactful, and it was shot in black and white! I really liked Bohemian Rhapsody... it's nowhere near perfect, but a good biopic and very well produced. The critics are morons. I also saw Venom this weekend, I went with zero expectations but I enjoyed it very much. I don't know what the people are expecting, it is a superhero movie, it was entertaining, money well spent. (i don't know venom's backstory nor I've read any comics with him so I don't know if they bastarrdized the history or not). The main issue I had with going into the movie was the fact that Venom's backstory is completely, unequivocally, 100% intrinsically tied to Spider-Man. The symbiote was first (inadvertently) used by Spider-Man, which is why he wore a black costume for a while. When he realized it was a living organism that wanted to permanently bond with him, he rejected it and forced it off of his body. Physically and mentally damaged, the rejected symbiote happened upon Eddie Brock, who had loads of resentment and anger toward Spider-Man and perceived slights he perpetrated. Sensing this, it bonded with Eddie and they eventually called themselves Venom because they would "be a poison to Spider-Man". Everything about Venom and his backstory involves Spider-Man, so removing that kinda kneecaps the character to one degree or another. Oh.. I get it now. Yeah.. that was a huge part of the history left out. I can see now what the hoopla was about. Overall I think it is a good movie and for a newbie the story made sense, but i get that people are angry at the spiderman ommision. Hey I will admit I was surprised. Hardy carried it. He was a joy to watch(as always). As for Bohemian Rhapsody I loved it. But I am a Queen fan so I am biased. Still I get why some folks wanted it to feel more...dramatic? I guess.... But man it just felt so good to watch and listen. To see how they came up with the songs and why. It showed how close they were to each other. I liked that it felt good. I was pretty much smiling the whole time and it's why I enjoyed it. Since there was more than one symbiote in the movie (literally milions of them, right?) there is still room in the Marvel movies to have the black suit storyline. I'm going to guess they are just going to skip it unless they decide their next big event after Infinity War is Secret Wars. Then, they would have a handy excuse for their to be another symbiote. Sadly, it seems like their next storyline after Infinity War is "Secret War" which never played out that big in the comics. It's just Avengers vs Skrulls and it wasn't done well. I think it will work in the movies, but it is really the exact same storyline as Winter Soldier... everyone turns out to be a bad guy except the Avengers. We have seen it before. I'm dying to see where they go with Doctor Strange II though. Loved the first movie.